(CNN) -- Floyd Mayweather Jr will have to pay Juan Manuel Marquez a reported $600,000 after weighing in two pounds too heavy ahead of Saturday night's welterweight showdown in Las Vegas. 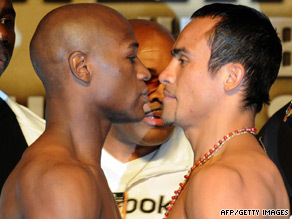 Floyd Mayweather Jr, left, faces off with Juan Manuel Marquez ahead of Saturday night's fight. Fight promoters Golden Boy confirmed after Friday's weigh-in that there had been a contractually agreed weight of 144 pounds for Mayweather's comeback bout, and that the American would pay a stipulated -- but undisclosed -- amount for every pound over that amount. As it was, Mayweather tipped the scales at 146 pounds and Mexican Marquez, whose usual weight is around 135 pounds, was weighed at 142 as he stepped up from lightweight for the fight. The maximum for a welterweight is 147 pounds. "The fight was contracted as a welterweight fight with an agreed upon weight of 144 pounds. However, there were pre-negotiated weight penalties built in," Golden Boy CEO Richard Schaefer told ESPN.com. The website also reported sources who stated that each extra pound would cost Mayweather $300,000, thus giving Marquez an additional $600,000 on top of his $3.2 million guarantee for the fight at the MGM Grand Garden Arena. The 32-year-old Mayweather, who returns to the boxing ring for the first time since December 2007 when he beat Ricky Hatton to retain his WBC world welterweight championship, has a reported minimum guarantee of $10 million before pay-per-view TV revenues are added. Mayweather is undefeated with a career record of 39-0, while the 36-year-old Marquez, who holds the WBA and WBO world lightweight belts, has 50 victories from 55 fights, 37 by knockout. Meanwhile, Nikolai Valuev will defend his WBA heavyweight title against British boxer David Haye in Germany on November 7. The fight, originally announced in July, had been in doubt as American John Ruiz lodged a legal challenge claiming that he was the giant Russian's mandatory challenger. However, the 36-year-old's promoters have clinched a deal with Ruiz, meaning the bout can go ahead as planned at Nuremberg's Arena Nurnberger Versicherung, where Valuev beat Sergei Liakhovich in February 2008. The 7' 1" Valuev, the tallest and heaviest boxing champion of all time who has a record of 50 wins from 52 fights, will dwarf the 6' 3" Haye, the former undisputed cruiserweight champion.